Wedding is a sacred moment that happens in everyone’s life. And every couple certainly has a place and concept of marriage that was dreamed of before. Wedding is a process of embedding the sacred promises that will be made by the bride and groom. Therefore, some people might want different places and venues for their happy day. Famous as a loving island, Bali seems to be the right choice for you to realize your dream wedding. In Bali, you have many choices of locations. Some people choose to get married on the beach, on a cliff with a view of the open sea, or it could be in a location surrounded by forests or rice fields. 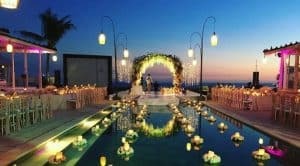 Here are the list of romantic wedding venue in Bali to complete your marriage day. This resort is located in the South Kuta area, Bali. Resort at this height looks so perfect with a beautiful view of the beach below. The vast expanse of blue sea becomes a beautiful view for your invited guests. It is located on Jalan Villa Kandara Banjar Wijaya Kusuma Ungasan, Uluwatu, South Kuta, Bali, Indonesia. This resort is designed to meet the best wedding experience. It is located on a spectacular limestone cliff above the Indian Ocean. Karma Kandara consists of 54 1-5 bedroom private pool villas. Each offers a private swimming pool, en suite and living room, spacious kitchen and dining area with advanced equipment, sleek contemporary furniture and traditional artwork. BVLGARI Hotels & Resort Bali is a special location for exclusive wedding ceremonies combined with Bulgari style. One of the favorite wedding ceremony concepts at Bulgari Resort is The Water Wedding. 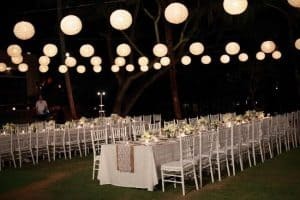 But each type of wedding ceremony is equipped with a very beautiful flower arrangement by a famous flower designer, and is equipped with a ceremony that will be inaugurated by the saint. A person who has their wedding plan tends to make their wedding experience in Bali perfect and unforgettable. The altar or aisle at Bulgari Resort Bali is set on a soft transparent carpet as if it looks floating on the surface of the pool water. 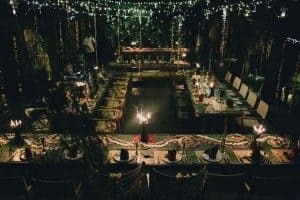 A truly unique experience, for a wedding ceremony held in front of a saint with a view of the Indian Ocean. Of course it will be the perfect wedding venue in Bali. The location of this place is in Goa Lempeh Temple, Banjar Dinas Kangin, Pecatu, Uluwatu, Bali. If you happen to be over budgeting, there’s nothing wrong with holding a superstar classy wedding at the Edge. 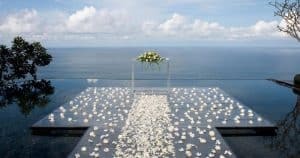 Located in southern Bali, The Edge offers a different wedding experience with an exclusive resort at the edge of the cliff. Often referred to as “Heaven of the world”, The Edge also offers 5-bedroom villas, with cinema halls, wine rooms and children’s entertainment spaces as facilities for couples who will bind promises. The Edge is also a reference for various international caliber celebrities such as Vivian Hsu. The Edge is also ready to adjust facilities according to the number of invited guests. Especially for couples, unique spa rooms and butler services are also provided. The Edge Bali is really trying to spoil every guest like “superstars” – like many celebrities who have held their marriages here, like Taiwanese star Vivian Hsu. This chapel is very in accordance with its name which means diamond. This unique shaped chapel has a height of 15 meters, and the pavilion is located in the middle of a pond that gives the impression of luxury. 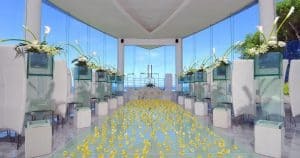 This diamond-shaped chapel also offers stunning sea views from the glass. This chapel is also amazingly suitable for those of you who are planning a large-scale wedding. 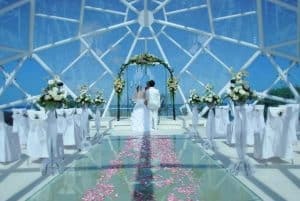 Diamond Bali holds the title as a pavilion for the biggest wedding event in Bali with 60 seats. This is of course quite a lot when compared to other chapels which tend to be smaller. Diamond Bali is also known as the most beautiful chapel in the world. Wiwaha Wedding Chapel has been popular among couples who want to combine modern style and comfort, at affordable prices. The view that faces the Ocean, makes Wiwaha Chapel much favored for wedding venues in Bali. It is really comfort for a perfection of marriage all in one place. Just imagine, with the extraordinary sight of you making a marriage vow with someone you care about without any doubts is an extraordinary experience in your life. This is the perfect place for a wedding reception with several close friends and family. It’s no secret that Hong Kong diva Sammi Cheng held her personal marriage with Andy Hui here. AYANA Resort and Spa Wedding is famous for its sparkling wedding glass chapels, elite wedding planners, famous Rock Bar, and charming scenery. AYANA will truly provide an experience that is truly unique and not easily forgotten. You can freely request the celebratory receptions with family and altar design in such a beautiful way. Here, you can choose from seven different venues for your wedding package at Ayana, including two wedding glass chapels at Ayana, the villa president for those who want to have an exclusive wedding, 350 years ‘joglo’ Javanese design, traditional Balinese pavilion, bdi Taman with 2,000 white frangipani trees, or private docks for wedding ceremonies. Imagine if you held a wedding at this amazing place, it is so romantic. The next venue is perfect for those of you who are looking for an environmentally friendly, beautiful and green wedding venue. Located in Ubud, Bambu Indah gives the impression of natural and beautiful, but does not reduce the luxury of marriage. Under the shadow of a palm tree and on a wooden bridge that stretches over the river, you can hold a wedding that is sure to invite admiration. This location is perfect for couples who are very pro-greening movement because the villa provided also carries the concept of saving energy. If you want to survey the location, you can directly come to Banjar Baung, Sayan Village, Ubud, Gianyar, Bali. The location of this place is on Jalan Raya Tanah Lot, Tabanan, Bali. If you are looking for a reception place in Bali with stunning views, maybe the Pan Pacific Nirwana Bali resort can be your choice. 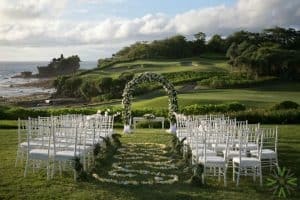 With a unique view of the temple in Tanah Lot, you can have a wedding that is certainly amazingly memorable, both for yourself and for other guests. You also don’t need to worry if you will lack space, because there is a large golf course that can accommodate approximately 400 guests. 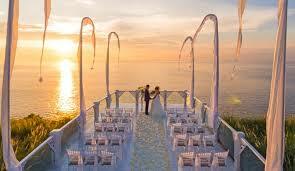 A wedding set in the background of a sunset in Bali will be an unforgettable experience that you will remember for life. The surfer’s paradise, Bali is already famous for its surfing spots. 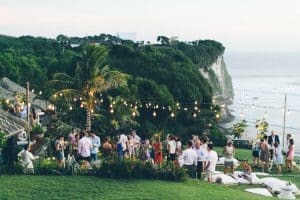 Well, if by chance you or your partner likes to surf, you can add the tension of surfing at your wedding by holding it at Uluwatu Surf Villas. With a vibrant view of the Indian Ocean, enjoy a casual wedding but still solemn. You can even hold your night wedding party on the beach. Joining friends and family with the beach at night, who doesn’t fall in love? This one venue has often been a reference for surfers who are looking for a reception place in Bali. 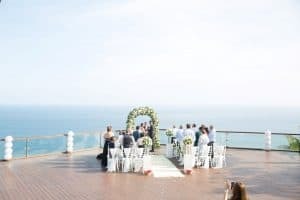 If you want to celebrate your wedding there, you can just check the location in Suluban Uluwatu, Pecatu, 80364, Bali, Indonesia. The beauty of Villa Plenilunio is centered on a joglo building located in an open courtyard with a swimming pool in the middle. This location is commonly used for couples when holding a wedding reception. This villa, located in the Uluwatu area, Bali, offers a view of the Indian Ocean that is ready to witness your love with your partner when you make a sacred promise. You can choose all-white decorations with floral decorations and small lights or candles to add a romantic impression. The best time to get married there is of course in the afternoon. Sunset views will perfect your wedding moments. 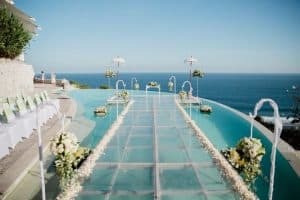 Tirtha Bridal is on a majestic cliff top. Enjoy the incredible sea breeze and panoramic views of the Indian Ocean when you get married. Tirtha provides several interesting locations. One of the most famous is the iconic triangular glass building which is the main attraction. The building can be transformed into an altar. And interestingly, the bride must cross the pool in front of her to arrive at that location. Or you can also choose a location on the edge of the pool that faces directly onto the open sea when you make a sacred promise. You can combine the natural beauty of this place with minimalist decor with rustic style. Tirtha Bridal Bali is perfect for perfecting your happy wedding moment. This location has a beach bar concept suitable for those who want to hold a wedding reception with a more relaxed atmosphere. When the sky begins to show orange tinge, couples can capture and share their happy moments on the bridge to the beach with the invited guests. After that, you and guests can enjoy dinner and drinks while relaxing while enjoying the remains of sunset. The location is very close to the beach, but you don’t need to worry about feeling the chill of the sea breeze because La Laguna has provided a campfire that will add to the warmth of the atmosphere. The eccentric and rustic beach bar design makes the bohemian style the most suitable for the wedding theme at La Laguna. If you are looking for a wedding location that does not involve the beauty of the Bali sea, then the Sanctuary Bali Villa is perfect for your wedding. This villa in the Canggu area offers open land surrounded by shady trees as a wedding venue. The Sanctuary Bali will give the impression of being the perfect woods for your wedding. 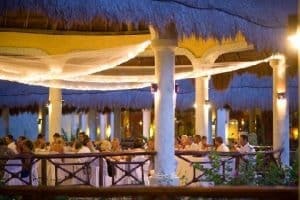 During the dinner, couples can choose the concept of fine dining with a long table or a more relaxed sitting. 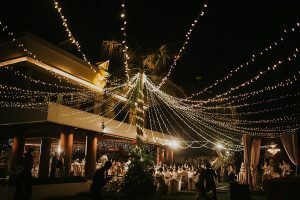 To give a romantic impression, you can choose decorations that are dominated by small lights as the roof of the reception area that will light up like a star when night falls. After Reading those wedding venues, you might be interested to make your own day in Bali with your groom or bride. You will be the happiest host ever since you can make your invitation happy to come to your wedding. the Remember that Bali is too beautiful for your best day in a life.